In our earlier posts, we discussed on how you can limit the number of deliveries for date and time from Order Delivery Date Pro for WooCommerce plugin. Those posts explain to limit the number of deliveries based on the orders placed for the date and time. But some businesses can deliver only a maximum number of product quantities per day. For example, you have an exotic oil shop where you can deliver only 25 hair oil bottles per day. And you want that the delivery date and time should be disabled for further deliveries in the calendar after 25 items are already ordered irrespective of the number of orders. You can find the setting for limiting the deliveries per product quantity under Order Delivery Date -> General Settings -> Date Settings. If you are selling organic juices and you can sell only 20 organic juice bottles per day. So you need to set the Maximum Order Deliveries per day (based on per order) option to 20. Once the limit per day is set, for allowing only 20 product quantities for a date, you need to check the checkbox “Enable Maximum Deliveries based on per product quantity“. This feature is also useful for the businesses who want to limit the number of deliveries per product quantity for time slots too. Now if a customer places an order for a product with 10 quantities with a delivery date 24th November 2016. Once the above order is placed, another customer adds 20 quantities for a product into the cart and tries to place an order for the same date 24th November 2016. The customer is not allowed to place an order for 20 quantities as the maximum deliveries per day is set to 20 and order is placed for 10 quantities. An error will be displayed on the checkout page. Once, orders for 20 product quantities are placed, the date will be disabled in the calendar for further deliveries with a label as “Booked“. 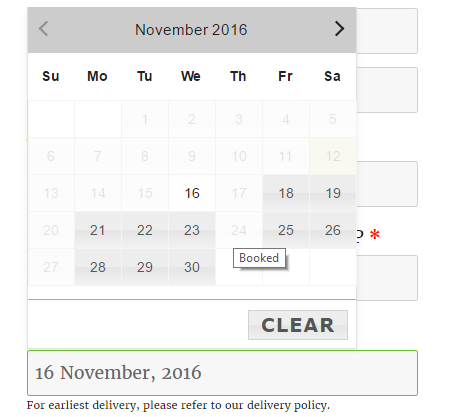 If maximum deliveries per time slot are set, then the time slot will be disabled for further deliveries on the checkout. In the above example, we saw how you can limit your deliveries per product quantity by using the plugin. The feature is useful for the businesses who can deliver only limited number of product quantities.